With less than a day to go we will welcome 2018 and we can look back at a great 2017 for the Hacking Tutorials website. In this small post I want to quickly stop by some accomplishments of 2017 and the Hacking Tutorials 2018 plans. The past year has been a great year for Hacking Tutorials and many new tutorials have been added to the website. Since 2015, the start of the Hacking Tutorials website, we have mainly published hacking tutorials that cover the basics of penetration testing. For 2017 (and 2018) we’ve raised the bar a bit by covering some more advanced subjects such as the basics of buffer overflow vulnerabilities, port forwarding techniques, advanced Netcat techniques and exploitation tutorials covering the full process of enumeration to exploitation and remediation. The latter can be found in the exploitation section of the website. Some other accomplishments for 2017 include the launch of the Virtual Hacking Labs, the switch from http to https (yes, finally!) and the first guest post by my friend Kgomotso Pule (hopefully the first of many!). In the Hacking Tutorials 2017 post of last year we’ve mentioned a focus on hands-on practical training in the field of penetration testing and ethical hacking in our plans for 2017. The implementation of these plans has led to the successful Virtual Hacking Labs platform with hundreds of students originating from almost 50 different countries. A great success that has been achieved in the first 6 months since the launch in May. However, true success cannot be measured by numbers only but by customer satisfaction. You can read what others have to say about the penetration testing course on the Virtual Hacking Labs Reviews page. 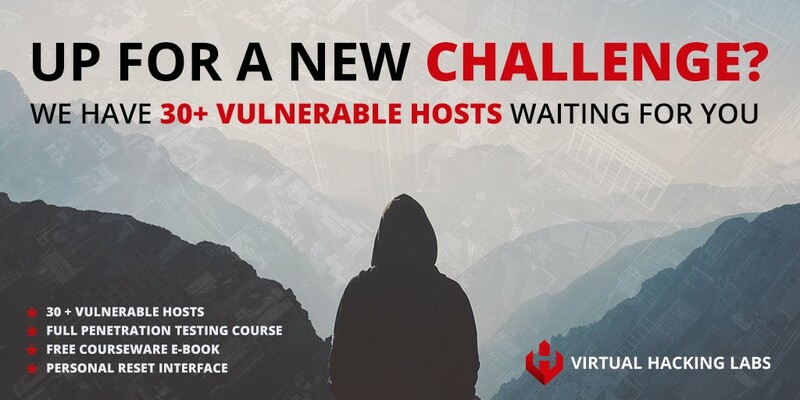 We were very delightful to see that many students used the VHL penetration testing course and online labs in preparation for the OSCP course, from which some students already passed the notorious 24 hours exam. More web application penetration testing tutorials. With a strong focus on how to exploit, prevent or mitigate this type of vulnerabilities. A full review of Mile2’s most advanced penetration testing course: Certified Penetration Testing Consultant (CPTC). As Mile2 courses were relatively unknown to me I was really curious to try this well priced course. The review of this course will be published in February on Hacking Tutorials! More Penetration Testing Tutorials covering more advanced techniques. More hacking book reviews. If you would like to review a specific book or like your book to be reviewed, please contact us! For now I wish you a Happy New Year! That you may pop lots of shells and all your dreams get executed as root in 2018! Thank you, HT! :-) Talk about pressure… I certainly hope that there’ll be a guest blog post soon. I would like to congratulate the HT and VHL team for creating an amazing content. I believe that many CEHs and aspiring OSCPs can find value in your material. VHL is very good and can help students of various backgrounds to learn a lot.